This page is about the British tank destroyer Achilles. For the premium version, see Achilles (65 Rg.). The 17 pounder Self-Propelled M10 (nickname Achilles) is a Rank III British tank destroyer with a battle rating of 4.0 (AB/RB/SB). 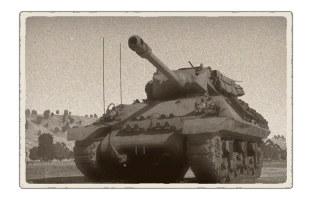 It was introduced in Update 1.55 "Royal Armour" along with the rest of the British Ground Forces Tree. The Achilles is based on the American M10, but carries 17-pounder as the main armament, making it an effective tank destroyer. Thanks to a well assigned BR, the Achilles won't feel in the wrong game even when facing higher rank tanks. For a Battle Rating 4.0, the Achilles plenty of firepower, especially once the Mk.8 APCBC shot modules is unlocked, which is more effective against the T-34 sloped armour. The 17-pdr cuts through enemy Panzer III and IV (the shots enter the front and exit from the rear) so try to aim vital points to cause the maximum damage (first shot to the turret to disable enemy firepower). The T-34 is a bigger problem due to its sloped armour. When facing Russians, the first shot should always be to the gunner. The Mk.8 APCBC is quite able to penetrate the T-34 glacis even from a distance but keep in mind that the damage the 17-pdr will cause is unreliable (sometimes 2 or more shots are required to destroy a T-34, sometimes one shot is enough). The M10 mobility is not outstanding, but the Achilles is pretty capable of carrying the player, gun, and event team where it needs to go. Protection is not good. The sloped armour and the track links added to the front will protect the Achilles from some low calibre shots, but the vast majority of enemies will be able to destroy the Achilles quickly. Side armour is paper thin. The high profile and the very slow turret traverse (man-powered) are not suitable for close range combat so avoid deep flanking tactics. Suspension wheels and tracks are 20 mm thick while the bogies are 10 mm thick. 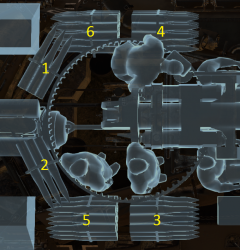 Hull rear sides are protected by attached grousers that gives 20 mm of extra armour. Tracks placed on the front transmission area provide 30 mm extra armour. Ammo rack of the Achilles. The Achilles is best used for sniping and shoot and scoot tactics. Find a good spot where to shoot at enemies, aim carefully (RB need a good use of mils range estimation) and enjoy the fireworks! Keep in mind the low fire rate (compared to other 17-pdr AFVs). Once the Achilles have destroyed (or damaged) the enemy, the best thing to do is to relocate. Don't stay in the same spot for too long: the Achilles has weak armour and an open top. Artillery barrages will cripple the tank destroyer and the crew. Another thing to think about is the turret traverse. Yes, it is really slow. Therefore, changes to the play style must be taken. If an enemy needs to be targeted quickly, do not rely on the turret. Instead, traverse the entire tank so that the hull is facing the enemy head-on, similar to turretless, casemate style tank destroyers. To avoid situations like this, stay way back, avoiding urban areas and other areas where the Achilles will be flanked easily. The Achilles performs very well on large maps with plenty of vegetation or terrain variations to hide. On maps like this, the Achilles can find a good hiding place and wait for enemy tanks to drive into the sights. Even the most heavily armoured tanks in the BR range cannot withstand the APCBC round. It is this tanks most redeeming factor. A well positioned Achilles can deal massive damage to an opposing team, and can even hold out an entire section of the map if it is protected from air support and can get the jump on attacking enemies. Remember to change position regularly as the Achilles will become easy prey for enemy aircraft if the situation is compromised. Also, remember to use the .50 cal. It can disorientate enemy tanks and potentially give a few extra seconds breathing room in a bad situation. It is also useful against SPAA and low flying aircraft. Be aware that if the commander is knocked out, access to the .50 cal will be lost. High level of penetration. Will often pass through the front of lighter vehicles and leave through the back. Spare tracks that provided some limited protection on the front and the rear section of the side armour. The M10 tank destroyer was developed in 1942 to fulfil the anti-tank doctrine established by the US military. The doctrine, creating the tank destroyer force, was established with the objective to stop German blitzkrieg tactics by attacking the tanks. Unlike the other armoured fighting vehicles in the theatre, the tank destroyers were made to be placed in reserves to counter any breach in the front lines by taking out the enemy with ambushes. This role led to the desire for a fast vehicle with a powerful gun; armour was not a concern due to the emphasis in speed. The design ended up taking a turret design developed from the M6A1 Heavy Tank and the body from the M4A2 Sherman, this with the 3-inch 1918 gun, provided the backbone of the American tank destroyer force in much of World War II. In total, 6,706 M10s and its variants were produced between September of 1942 to 1943 of the same month. These M10s were given out to America’s allies, though the British were the most well-known of these users, receiving about 1,650 M10s from the Americans from 1943 onward. The British designated the M10s under their service as the Achilles and unlike popular usage, was called that for both the 3-inch gun variant (Achilles I/II) and the variant mounting the 17-pounder (Achillies Ic / IIc). Though in most usage, the vehicle was called the 17pdr M10, or 17pdr SP M10, or even the “Firefly”, despite that name being used for a different design. The British first received the M10s with the 3-inch cannons, which were much more powerful than the British tank armament at the time, giving them an edge in many tank confrontations in the North African Campaign. It was around 1943 that conversion is done onto the M10 to increase its firepower capabilities against the gradually upgraded German tank designs such as the Tiger I and the Panthers. The conversion used one of the best Allied anti-tank guns at the time, the 17-pounder, which could penetrate about 140 mm of armour at 500 meters away with APCBC rounds, and 209 mm at the same distance with APDS rounds (Armour-Penetrating Discarding Sabot). The conversion is done onto the M10 also required a counterweight to be placed on the 17-pounder to compensate the heavier weight of the 17-pounder compared to the 3-inch gun. 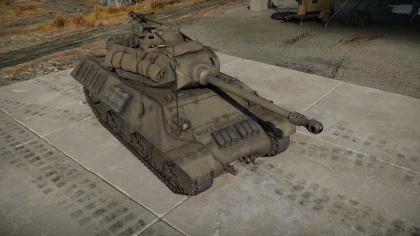 This gave the M10 Achilles a much more defining profile and attempts were made to hide this more substantial cannon length with optical illusion. Aside from the gun conversion, the M10 Achilles also had an extra 17 mm of armour welded onto the front and sides of the hull for added protection, plus a 20 mm shield on the top of the turret to compensate for the open-turret design. About 1,000 M10 Achilles with the 17-pounders were ordered, but by D-Day, only 124 were available, and 816 were done by the end of the year. The low number of these converted Achilles made meant that any lost units were hard to replace with a 17-pounder one, and the disgruntled crew would be issued an M10 with a 3-inch gun instead. In the end, about a total of 1,000 Achilles were converted into 17-pounder ones by the end of World War II, making the M10 Achilles the second-most numerous design to mount the 17-pounder, coming before the Sherman Firefly. The British doctrine with the Achilles differed from the Americans who saw it as a reserve tank destroyer. The British viewed it as a mobile anti-tank gun, thus the Achilles served in a role akin to the StuG III in German service, moving the 17-pounder into position to take a shot on incoming German Tiger or Panther tanks. These Achilles were used more with Churchill tank units rather than the medium tanks due to the lack of 17-pounder equipped on Churchills while the medium tanks have the Firefly available for use. Disadvantages with the M10 Achilles design were carried over from the original, the slow turret traverse speed, high profile, and open-top turret made it a rather harder vehicle to use than a regular tank, but it still had its advantages and was still suitable for the role it had. The Achilles were deployed on D-Day onward in artillery forces in anti-tank regiments in armoured divisions. A typical anti-tank regiment would have four batteries, two with towed 17-pounders, one equipped with 17-pounder Achilles, and another with regular M10s with the 3-inch gun (though replaced with another Achilles unit once more were available). A notable event with the Achilles was during Operation Charnwood, where Achilles in the 62nd Anti-Tank Regiment fought off a German counterattack comprising of Panzer IVs and Panthers from the 12th Panzer Regiment were routed by the Achilles 17-pounder fires, destroying about 13 German tanks with the loss of four Achilles knocked out and four more damaged. Skin and Camouflages for the Achilles in Warthunder Live. Achilles (65 Rg.) - Gift version, representing the 65th Anti-Tank Regiment. M10 GMC - Original American configuration of the M10 platform. This page was last edited on 5 April 2019, at 01:11.